Should video games tackle natural disasters like movies? Or is that just really poor taste? Nature may be the ultimate villain, but is she suitable for games? Between fires ravaging California, hurricanes decimating Caribbean islands, earthquakes rocking Mexico and countless other natural disasters, 2017 was one of the most destructive years on record. Art imitates life, so some of last year’s news reports are bound to inspire creatives in entertainment - or at least their financiers - but it seems unlikely that game developers will be among them. Disaster movies are almost as old as the medium itself. The genre that began at the turn of the 20th century with movies like the silent short drama Fire! from 1901 blossomed in the 1970s, when high-budget features like Airport, Earthquake and The Towering Inferno charmed audiences with their mix of edge of the seat suspense and expensive special effects. While, more often than not, disaster movies tackle imaginary cataclysms, movie studios are quick to capitalize on one of humanity’s most primal fears - facing the wrath of nature. So why aren’t video game publishers as keen? On paper, nature sounds like the ultimate video game villain: unrelenting, unstoppable, unpredictable and absolutely devastating. But dropping the comfort of the supernatural when crafting a video game apocalypse (ditching zombies, mutants, aliens etc) isn't that easy or common. Disaster Report - released as SOS: The Final Escape in the West - is a Japanese PlayStation 2 title which strands the player in a city freshly ravaged by an earthquake. It makes perfect sense that Japanese developers, faced with the reality of living on top of a tectonic line, make a game dealing with the aftermath of an earthquake. But while most games deal with the dystopian, societal consequences of various cataclysms (Ubisoft's I Am Alive springs to mind), Disaster Report drops us in the heart of the aftershock stricken action. 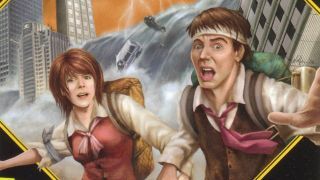 Disaster Report is not a great game by any stretch of the imagination, and its plot inevitably takes a turn for the kitschy, but it accomplishes at least one important feat: it strips the apocalyptic scenario of supernatural elements, casting the cataclysm and people caught in it as villains. Among the few games that followed in its path, the indie darling The Long Dark stands out as the one that learned its lessons best. There’s little doubt video games can tackle fictional, imaginary disasters, and build interesting gameplay around them. So, why don’t more developers go that route? Perhaps out of fear that players wouldn’t enjoy their games. We're accustomed to winning in games, and winning big. Saving planets, rescuing princesses. In a story about a natural disaster, it’s almost impossible to create heroes… most are just survivors. This begs the question: is barely surviving reward enough for investing long hours into a game? Modern games have found in niche in roguelikes, where surviving as long as possible and restarting is the core appeal, but few truly go mainstream because players love to win. Some could also argue that video games are about escapism and many are designed to make us forget about the real world, to turn us into heroes. Other games, however, like to comment on how rotten the outside world is, and they’re almost always hard to play. Games like The Last of Us manage to mix the two approaches and entertain us while telling a grim story of humanity’s literal and moral downfall, but it’s intensely depressing. It's the story of Ellie and Joel facing the end of the world together with no prospect of winning. Does the cause of the apocalypse matter at all? Skilled professionals such as Naughty Dog could easily replace the fungus infected quasi-zombies with a more immediate, believable, natural threat and build a game at least as gripping as The Last of Us… but would a publisher be comfortable signing off on a title with no obvious ‘villain’ or evil? Then there's the question of whether games are capable of handling the tales of real disasters in a tasteful manner. Building graceful and respectful narratives around the deaths of innocent people would be uncharted territory for a medium unproven in being graceful or respectful. We have no way of knowing how the world would react to, say, a game about the September Mexico City earthquakes, but the idea of retelling a famous (albeit hardly caused by natural forces) disaster story through video games isn’t a brand new one. Announced in 2015 by Polish studio Jujubee, Kursk tackles the sinking of the eponymous nuclear Russian submarine which perished with all 118 of its crew in the depths of the Barents sea in 2000. "Kursk will definitely be a game for mature audiences looking for a unique and cinematic experience," Jujubee's CEO Michal Stepien said. But he failed to convince everyone that a game about Kursk is a good idea. “It’s too soon”, some said. Others questioned whether "the new angle" the devs touted holds any promise of telling the tragic story in a tasteful manner. Another common accusations against Jujubee suggested that Kursk is trying to piggyback the famous tragedy for publicity. It’s not a natural disaster, but it’s a good example of how the world reacts to video games imitating real life tragedy. Unsurprisingly, the announcement of Kursk caused the biggest outrage in Russia. As quoted by The Moscow Times, some commenters floated the concepts of games about the terrorist attacks of 9/11, or 'Katyn: Shoot the Polish Officer,' referencing the mass murder of 20,000 Polish officers by NKVD in 1940. The controversy did little to help the game. Two and a half years later, Kursk remains nowhere to be seen without as much as a placeholder release date and no other game since dared to follow in its wake. While the outrage against Kursk was at least partially fueled by the rocky historical relationship between Poland and Russia, the case of Kursk illustrates the widespread sentiment that video games aren’t a medium mature enough to tackle matters as serious as tragedies claiming dozens, hundreds, even thousands of lives. Unless, of course, we’re talking about tragedies claiming millions of lives: wars. The argument that the idea of turning a tragedy of unimaginable scale into a money-generating product (be it a game, a movie or a book) is inherently in bad taste collapses under the weight of trigger happy war games like Call of Duty, Medal of Honor and their less successful imitators. What makes war different and so easily adaptable into a video game? War can be ended, avoided, even understood. Natural disasters can’t. War draws a clear line between the bad guys (them) and the good guys (us). But most of all, war is manmade. We know who to blame for it and where to seek redemption, even if that’s heavily subject to personal perspective. Natural disasters don’t offer the same comfort. Perhaps the real barrier right now is that a convincing natural disaster game would take a lot of work. The need to craft an entire world as an enemy, and to have it all act realistically is a hell of a challenge. And maybe that’s the real answer to why video games tend to steer clear of cataclysmic events: cost and resources. For a movie, it’s a matter of some expensive CG and some choice location shooting… but the experience is still passive and doesn’t need to ‘behave’ consistently. With games, the force of nature is a hard, hard thing to simulate. Morally, that’s probably a happy coincidence, but the upshot is that - spectacular as it may be - we’re unlikely to see a natural disaster game any time soon.